When Typhoon Haiyan struck the Philippines on November 8, 2013, it was the most powerful storm to ever make landfall in the Pacific. It was also the acid test for the ACT Philippines Forum, which had only been created 3 months earlier. The forum has just released an evaluation of the Haiyan response which highlights the accomplishments and the lessons learned from this massive relief effort. Acting Together, Building Stronger highlights the importance of partnership throughout the response. “This learning document tells the story of the collaboration of churches, agencies and organizations worldwide as they prayed for the people of central Philippines, gave material and financial donations and rendered help until the survivors were back on their feet,” wrote the Rev. Rex RB Reyes, Jr, General Secretary of the National Council of Churches of the Philippines in the foreword. The report shows the focus that ACT members brought to a variety of issues that are key to ACT’s work globally: a focus on gender and people with disabilities, a rights-based approach, disaster risk reduction, and adherence to international standards including Sphere and the Core Humanitarian Standard. Specific stories of these issues include the success of a campaign to allow thousands of families access to housing despite their lack of land claims, a programme initiated and operated by women in one community to become income earners, and the creation of a federation of people with disabilities. 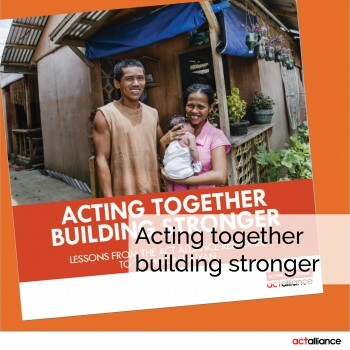 Thanks to the work of the ACT Philippines Forum, the lessons they have learned and the best practices they have developed are available for anyone to read and share in Acting Together, Building Stronger, which can be read in its entirety here.